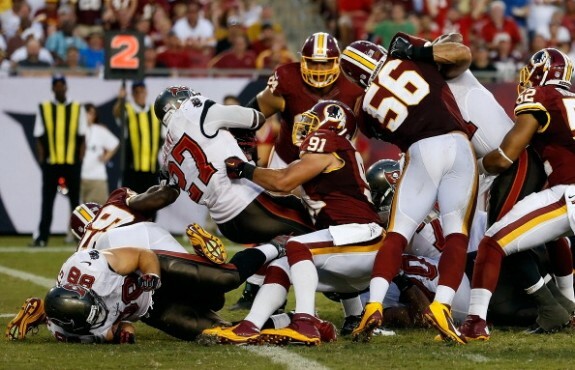 It’s a tough lesson in the NFL to learn, and Sunday at home vs the Redskins, the Bucs learned the lesson the hard way. They failed to do it against RG3 and the Redskins, and Billy Cundiff nailed a 41-yard field goal in the closing seconds of the fourth quarter to lift the Redskins over the Buccaneers 24-22. The loss puts the Bucs at 1-3, while the Redskins improve to 2-2. Cundiff missed kicks of 41, 57 and 31 yards before drilling the game-winner for the Skins, who rebounded after a loss last week to the Bengals at home. “I was really pleased with him to miss three field goals and still keep his focus and come back and make that game winner. That says a lot about him,” Redskins coach Mike Shanahan said about Cundiff. Robert Griffin III threw for 323 yards on 26-of-35 efficiency and added a rushing touchdown in the win. Alfred Morris carried the ball 21 times for 113 yards and a score for the Redskins. The final drive saw the Redskins being able to move the ball when they needed to. Griffin says it’s all in a days work. The Bucs wiped out an 18-point deficit to go ahead 22-21 on Connor Barth‘s third field goal, a 47-yarder with 1:42 remaining. Josh Freeman completed 24-of-39 passes for 299 yards with a touchdown and an interception for the Buccaneers (1-3), who dropped their third straight game and are heading into their bye week. Mike Williams had four receptions for 115 yards for Tampa Bay, while Vincent Jackson finished with six catches for 100 yards and a touchdown in defeat. With regular officials back on the job, the Bucs were flagged twice for unnecessary roughness on the Redskins quarterback – once on a throw out of his own end zone and the other when he was picked up and dropped for a 2-yard loss by Tampa Bay rookie safety Mark Barron on a designed run. Barron read the quarterback keeper perfectly, but was flagged when he lifted Griffin into the air before dumping him to the ground and falling on top of Griffin. The 2011 Heisman Trophy winner bounced right up, clapped his hands, then threw for 20 yards to Garcon on the next play. 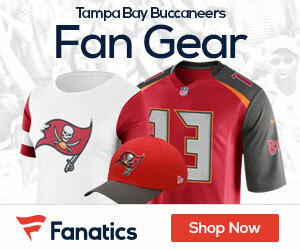 Tampa Bay’s offense sputtered until Freeman connected with Williams on a 65-yard pass that led to the TD pass to Jackson that trimmed Washington’s lead to 21-13. Two more completions to Jackson, this time for 54 and then 22 yards, set up LeGarrette Blount’s 2-yard TD that helped the Bucs pull within 21-19.